Welcome to Strongman Magazine Online! March 26th 2006- Site being overhauled, will be relauched soon. Magnús Ver Magnússon has won Iceland's Strongest Viking, with Benedikt Magnússon 2nd and Jón Valgeir 3rd. More on the News page. Mariusz Pudzianowski wins the Moscow Super Series. See final placings on the News page. 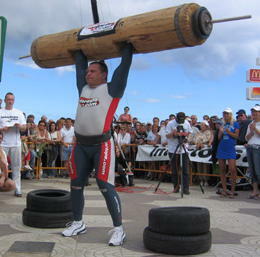 Ralf Ber wins the 4th round of the World Strongman Cup in Luna Park Germany. More to come soon. Tarmo Mitt wins a International Competition held in Estonia, winning 4 out or 5 events. Read final standings on the News page. Uli Schwarz wins the 2nd round of the German Cup. See more on the News page. Magnus Ver Magnusson has won the title of Iceland's Strongest Man. Benedikt Magnusson came 2nd and Audunn Jonsson 3rd. Franz Müllner has won Austria's Summer Giants for the 2nd year in a row. Final Placings on the News page. Tomi Lotta wins Finland's Strongestman and Kati Luoto wins Finland's Strongest Woman. More on the News page. Julie Dunkley wins Britain's Strongest Woman. More on the News page. Strongman wallpaper has now been added to the site. New paper will be added periodocly over time. A news page has been added, as well as a competition calender for 2004. I have also added a guest book. The athlete profile section is now up. The site will be going under some retooling. The purpose of this online magazine is to bring you information and interesting stories from the world of strongman. Events, training and athlete profiles as well as some other interesting stuff will be printed here. Be sure to check back in the coming weeks as i will be adding articles in the very near future. Early articles will include covering the farmer's walk and a couple of athlete profiles. Future articles will include a first time strongman competitors story, as well as some highland games events discriptions. If you are a strength athlete and would like to have your profile on this site, please get in touch !